This post is sponsored by You Need A Budget. Thanks for your continued support of Daily Garnish! In January of 2015 we set out on a path to start our own business. It didn’t happen overnight – it was more of a slow slog, really – but almost immediately we knew we needed to make changes. The biggest change of course, would be financial. The end goal of starting our business was always to eventually transfer Casey into a full-time role working for himself. Of course this meant a big financial change from what we were used to, so we had to start thinking about and managing our money differently. In the past we’ve used programs like Mint, as well as self-made spreadsheets, but I am not a natural budgeter and I was easily frustrated by lack of customization and excessive advertising that came with some of these programs. Recently we’ve started using You Need A Budget – a budgeting web app (with companion apps for your phone), that has really changed the way that we’ve been viewing and spending our money. First I’ll tell you a bit about YNAB and the way it works, and then I’ll share some personal ways we are tweaking finances and making changes! Exciting stuff! And before I do that, you can click here to get your first three months free – no credit card required! Also, it’s always free for all students! YNAB is really easy to set up, and it took me about one hour to get all our accounts synched and organized. You can directly import your bank accounts, credit cards, mortgage information, investments, etc. – so that you can see your full financial profile in the sidebar. The philosophy behind the YNAB method of saving and organizing comes in four rules. 1. Give every dollar a job – This means that every dollar you have is accounted for – whether it’s budgeted, saved, or spent. This greatly reduces the likelihood of overspending or surprises. 2. 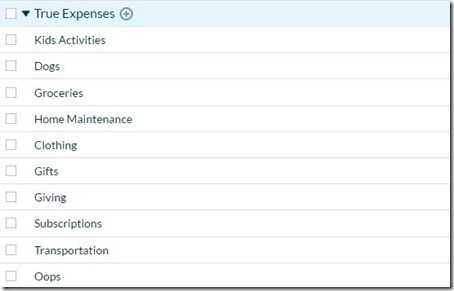 Embrace your true expenses – This is one of my favorite features of the program. True Expenses are those things that come up periodically (but don’t require payments every month) – car repairs, a broken water heater, birthday gifts, travel, etc. Instead of seeing these as big lump sums that have to be dealt with in one month, using True Expenses helps you set money aside monthly for so you are prepared when the times comes. 3. Roll with the punches – Overspending happens to all of us. And instead of freaking out when a budget goes into the red, YNAB allows you to move money from one budget to another, so you can cover overspending. 4. Age your money – Once you get beyond the 30 day mark, you can start paying bills with money you saved 30 days ago, and get yourself out of the paycheck to paycheck cycle. This is also a great way to make sure you aren’t carrying balances forward on any credit cards. Here are the basic budgets and expenses that we are categorizing for our family. My goal was to make it specific enough, but not to make it so detailed that it became unmanageable. Our Immediate Obligations are things that are monthly bills – these are typically the same amount every month, and rarely surprise us. Our True Expenses are the things that need more specific budgeting – like kids activities and groceries. This month, I signed Cullen up for summer swimming lessons so we are already over budget for kids activities – I’ll need to pull that money from other areas to cover the difference. Hopefully down the road as we’ve use the program longer, there would have been enough month to month roll-over to cover that excess. Same goes for the pet expenses, as we had to pay for Huey’s cremation and vet services, which were several hundred dollars. And our Quality of Life Goals are the other extras that we’d like to save for. I’m not sure why they included the education categories here, and since they are part of our regular monthly bills I will probably move them into Immediate Obligations. One thing I’ve always been frustrated by in other programs is the need to assign each transaction to ONE budget. You Need A Budget allows you to split transactions – meaning if I go to Costco and buy a bunch of different things, I can then break the transaction down from the receipt – allocating part of the total toward groceries, and the rest toward budgets for dogs, household items, kids, etc. Without being able to do this before, our grocery budget would go way over because it often included other incidentals that snuck their way into the food category. For us this meant focusing our “extra” money on allocating for the things that are really important to us – travel and savings. With all of our family living thousands of miles away, travel is a part of life. And unfortunately, we can’t realistically pack up the car and drive to our loved ones – trips home require plane tickets – four of them! One change to the way we’ve thought about travel as we’ve worked on our budget is to pay more attention to the big picture – travel is not just plane tickets and accommodations. It is also things like dog sitters, destination activity money, and incidentals. It’s important to include ALL of those things in the travel budget, and not just the big pieces. We also try to use skymiles and promotions, as well as book far in advance to get the best deals. Savings is self-explanatory, but obviously very important. Now that our income has shifted to both being self-employed, we are looking to be a lot more mindful of actively saving, and finding new ways to do this. Neither of us is into fancy labels or clothes, and our kids wear very basic stuff that’s all bought on sale. We don’t have a ton of toys, and what we do have often comes from Craigslist or resale shops, or from neighborhood FB swap groups. But we do care a lot about the quality and source of our food, so we shop at higher end grocery stores and pay more for food that meets our family standards. I’m happy to wear old jeans and eat good cheese – again, all about priorities, because we can’t (and don’t need to) have it all. Budgeting 101 will tell you that many small charges will add up to lots of spending. And while of course we all know that, actually remaining mindful of it every day is another story. It’s easy to see something as “only $5” but spending that extra 5 dollars every day can add up to almost $200 each month! I look for little ways to save by not buying drinks out, always searching for free parking, and trying to stick to free kids’ activities. It’s easy to spend $20+ on admissions to kids’ places, and while that can be tempting in the rainy slog of winter, this year I was much more mindful of sticking to the spots where we have memberships, utilizing free First Thursdays at museums, and getting more creative with art projects and activities we did at home. The biggest changes we have made in the past few years have been car-related. We traded in our big SUV and now I drive an entirely electric tiny Nissan Leaf! I can write more about this change in another post (if folks are interested), but it has been a huge savings to us. And I have found that it is actually plenty roomy for our needs (I can get my double BOB in the back! ), and it is a million times easier to park in the city too. We pay zero gas, zero maintenance, and the estimated cost in electricity to charge the car is a whopping $150 per year. We also bought it when there were both federal and state tax credits available, so it was very affordable. Casey has a business truck, and that was also chosen with affordability and functionality being the most important considerations. We are not fancy car people, so we are fine with base models, fabric seats, basic radio, etc. – since having fancier cars isn’t something that really appeals to either of us, it didn’t make sense to be spending any extra dollars there. We also looked at things like fitness memberships and classes, prioritized and picked the things we wanted to do most, and cut out the rest. Part of what I love about running is that other than the gear, the workout itself is FREE, and it’s available right outside your front door pretty much all the time. This topic is mostly food related, and it means to literally stop throwing money away. I get super frustrated when I fill up the kids lunch plates and they don’t touch them, and perfectly good food ends up in the garbage. These days, if they don’t want to eat something I don’t force it, but the plates go back in the fridge and are offered an hour later when the kids are begging for snacks. It also means paying better attention to what food we already have, and using that up before we buy more. I tend to be the immediate gratification type, so I’ve had to really work on cooking and eating food that is on hand instead of always making exactly what we WANT RIGHT NOW. This has helped immensely in reducing our food waste, and cutting down on grocery bills. This is something that I have to be mindful of daily. It is so easy to grab those little things here and there, but I often regret them a few hours later (and they add up so quickly!). I actually don’t shop in stores (other than grocery stores) often at all, so for me the issue is online shopping. With Amazon apps and discount coupon codes right at our finger tips all day long, it is SO easy to spend money without even really thinking about it. We are big time Amazon users, and recently I’ve been forcing myself to put things in my cart and wait a few days before checking out. More often than not, I end up taking most items out other than essentials because the “need” for these items wanes away pretty quickly. I’ve also unsubscribed from most of the promotional brand and store emails that flood my inbox all day long. If I don’t know that Gap is having a 40% off sale, I’m not going to be tempted. I’m a huge sucker for sales, but I also know that buying something on sale is still spending money that wasn’t necessarily planned for or budgeted. Also, buying less makes the things that I do buy feel a lot more exciting! So there you go – a look into how we’re managing the shift in finances as we navigate the world of self-employment and business ownership. It’s such an exciting time for us, and being more connected to our money gives me a much better understanding of our financial health on a daily basis, which leads to daily peace of mind as well. Thanks so much to You Need A Budget for helping us look at finances in a new way. If you want to try YNAB yourself, click here to get your first three months for free (with no credit card required)! Next Post » Tulip Town 2016. You are the third bloggers who has recently reviewed YNAB and this has been the most helpful review I’ve seen. Some of the specifics you shared about the program/app have swayed me in to giving it a try. Thanks! I agree!! I have read the other blogger’s YNAB posts and have been pretty unimpressed, thinking “It doesn’t sound like they even USE this. Because if they did, they would be much more enthusiastic and have real-world examples of why it is AWESOME” We have ben using YNAB for over a year and I would venture to say it is life changing. Thanks for the great post! Agreed! I tried it after seeing another blogger do a post, and was near tearing my hair out because I found it so confusing and difficult to use. While I still think their platform is not the most intuitive, you’ve encouraged me to give it another try. Thanks for always actually writing about the products you sponsor, and not just dropping in the brand’s content from their site. I just started using it tonight, and it makes me feel better that I’m not the only one that was literally pulling my hair. For such a “simple” and “revolutionary” system, the platform is….confusing at best, infuriating at worst! I hope to get the hang of it over the next few months. Yes, please write about the electric Leaf! I signed up for YNAB and then abandoned it after a few days. I’m self employed which makes my income wonky but I think if I actually applied myself to it, it would be very helpful. The trial might be just what I need. I will write about the Leaf! I find that is so easy to do with budgeting — it really takes a few solid weeks of daily reminders to check in before it becomes habit. I’d love to read about the Leaf. I drove one once while our previous car (a Nissan) was in the shop. We’re going electric for my husband’s next car in a few years. Elle, I’m self-employed too, so know the pain of trying to budget with YNAB with variable income! There are a lot of great tips out there if you search the YNAB forums for variable income, but the key is working to build a deferred income balance. You put any overage into this account in a flush month, to supplement a month where your income is less. 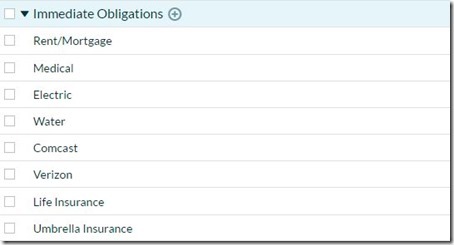 I was fortunate to have the funds in savings to set up my deferred account right away, and with each month I apply the rule – anything over my expenses (after savings and everything else – don’t forget to save when you can!) goes there to use in a leaner month. It’s so freeing, and I no longer worry about slow downs or time I might lose when I’m sick, or whatever. There’s a plan there to cover it! Good luck, it’s really worth doing if you can. Elle, I had the same thing – for some reason, I just could not seem to figure it out. I also couldn’t really find resources on the site that helped – they kept encouraging me to watch their videos, but I absorb things much better when I can read through them a few times. Totally!! If I see the sale, I feel like I’m MISSING OUT on things I didn’t actually need in the first place. Dangerous! Please write about the Leaf! We are due for a new car in the next 1-2 years – and we are debating between the Volt, Leaf and the new Tesla! I will snap some pics today and write a post soon! I’m obsessed with my Leaf! We have a few friends in line for the Tesla too, but for now we’re really happy with the Leaf! It is so obvious you put a lot of time into every post, sponsored or not. This was so helpful, whereas the other posts I’ve read from other bloggers on YNAB didn’t cover the details well like you did. And I love the part about eating fancy cheese in old jeans because I am the exact same way! Thanks so much Reid — really appreciate it! I was going to try YNAB but the reviews on the app store are terrible! It looks like the customer service is too. It’s too bad, I was going to join but I think I’ll pass! I also unsubscribed from all the store emails and it’s helped tremendously! Interesting — I wonder why! I haven’t had any problems so far, but I’ve only been using it a few weeks. Haven’t had to use customer service for anything, but I think the website is really well done and easy to manage! I have been using it for over a year and LOVE it. There also is a huge forum on the YNAB where people are great to answer questions regarding it. I vote to give it a shot! I’m surprised to hear it has poor reviews?? Great post! I would love to read about your car switch, too. I love my hybrid – electric would be amazing though! 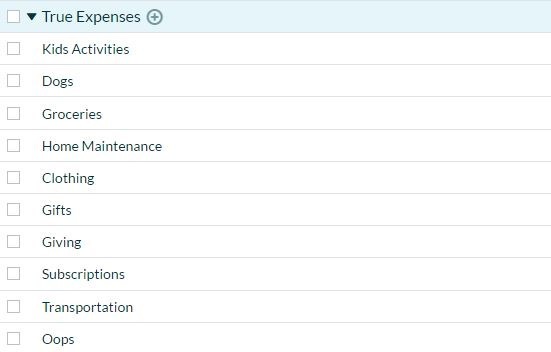 I use an old school excel spreadsheet for budgeting, but would love to have the ease of YNAB – but am hesitant to have to reset everything up. That part of budgeting is very time consuming, I find! This is the best! I downloaded YNAB over a year ago, got really overwhelmed (anything finance related in general is overwhelming) and gave up- this is just what I need to go back to it, focus and get it done! A really clear review. Thank you. I’d be interested in a Leaf review too. We bought an electric bicycle a while back and I tow the kids in the trailer. It’s so cool and super cheap to run. Thanks for the review! Any idea how much it costs after the free trial? I can’t the information on their website. Thought I’d check with you before I email the company. When I checked the webpage it said $5 a month or $50 a year. Thanks for this, and you are correct! Just getting to the comments and questions now! Great post (as usual)! I, too, have read several other reviews of YNAB, but haven’t been convinced to give it a try until now. Especially appreciate the tidbit about it being free for students! Regarding store emails, I have all of these emails automatically filtered to go straight to a specific email folder that I don’t read. If I decide I have a true need for something, I’ll check that folder for any relevant coupons/sales before buying. I definitely do less online shopping now that I don’t see promotional emails daily! I actually do that too, and it’s been a big help! I am guessing that the education parts in Quality of Life is for future college expenses vs the more immediate daycare/preschool. I just read an article this week that daycare expenses in my area are more per year than our state school’s tuition/year. (Here in Massachusetts). Yikes! I read that one too! You are probably right, but I guess I saw college expenses more as part of long-term savings. That’s the great thing about a flexible program — something different for everyone! As a long time reader I might have commented a couple of times. I have to say that I find those sponsored posts quite annoying even tho I know and love YNAB (we’ve been using it for over 2 years and it has brought amazing changes in our family and my marriage). I hope you go back to writing more genuine and heartfelt posts soon (the holiday photo dumps are ok but a bit boring to me, I have to say). I used to find your writing so touching and easy to read.. Surprised that you’d be annoyed be seeing me partner with a product that you seem to really love! These campaigns are also ways to help those companies be more successful, which is a win for everyone. This post was very genuine, if you take the time to actually read it! 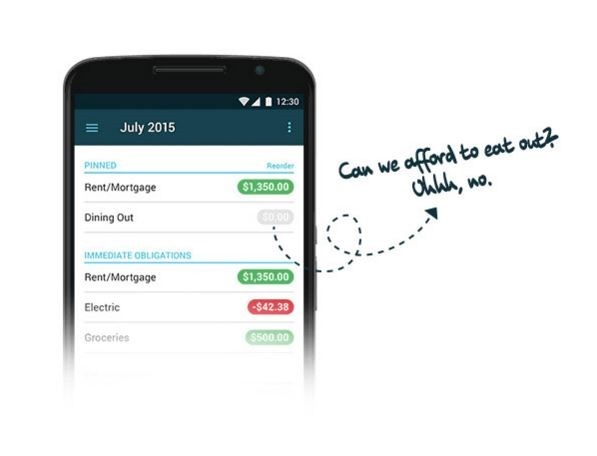 Not sure if I’ll check out the app or not, but this post is pretty timely because I really do NEED a budget! My husband and I never combined finances and I feel like we really need to sit down and go over all the details of where our money is going. We’ve both been saying it for a while, but we haven’t gone through the process… needs to happen soon! I need a budget, plain and simple! I have been in a rut and spending too much on things I don’t need. I’ve always found te thought of budgeting so overwhelming. That’s huge to see you can split 1 cost for different areas of a budget. Like groceries for example, if I get them at Target, I will get other things there too. Looking forward to signing up and tackling my budget this weekend! Yes, LOVE the splitting bills — game changer for me. Makes total sense. Yes… Please write about the Leaf. My husband is looking for an electric car, his commute is not horrible for length but traffic…We deal with the South Sound traffic so it’s never fun. He’s looking at hybrids but is seriously considering all electric. But he’s also very tall. What was involved with getting an at home charging station and all that jazz? The app sounds fab but my husband is a spreadsheet guru so we’ve always used that. Sounds like the app is a bit more intuitive and flexible than others. I definitely will — it’s the perfect car for a city like Seattle!! I seriously needed to hear about this service. Budgeting is something my family struggles with. I will definitely be checking this out! I would love to hear about the leaf. We are currently considering replacing my husband’s old Subaru (which has been costing us more money than it’s worth lately) with a 4-runner which while I realize isn’t very green, we live in Colorado and do a lot of summer camping. I’m definitely interested in electric cars and would love to hear more about your experience! Yay! Glad it will be useful, I’m really enjoying it. I love the 4Runner too — some good friends have one and LOVE it! I did the same thing with promo emails when we were saving for our around the world trip. Out of sight, out of mind. Right?! I just signed up for YNAB and am working through the details of it. Love it so far even if it gets a bit confusing. Looking forward to seeing how it goes in a month from now! LOVE me some YNAB – it’s the best program for the self-employed, I think. But you really do have to read all the material and take all of the classes to really get all the value out of it. Invest the time and it is GREAT.